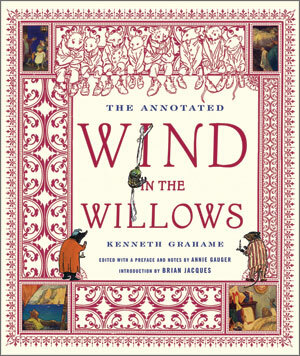 To celebrate The Wind in the Willows, scholar Annie Gauger offers this beautifully illustrated edition of Kenneth Grahame’s classic—complete with rare photographs of the Grahames, their friends, and illustrations from the first five editions. An instant bestseller upon its initial publication in 1908, The Wind in the Willows has become one of the beloved stories of all time. How could Ratty and Mole have known when they took to the river over one hundred years ago that they would begin a phenomenon that would produce one of the most oft-quoted lines in British literature, and inspire everyone from the creator of Winnie-the-Pooh to Pink Floyd? 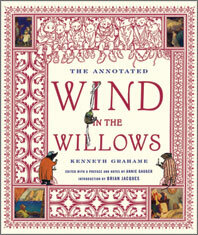 Drawing from more than a decade of research, Annie Gauger, one of the world’s leading experts on Kenneth Grahame and The Wind in the Willows, now presents a fascinating new annotated edition that reintroduces readers to Otter, curmudgeonly Badger, and rollicking, boastful Toad, while revealing the secrets behind this treasured classic. In The Annotated Wind in the Willows, readers will discover the sheer joy of the original text, restored to the original 1908 version, illustrated with hundreds of full-color images—including the beloved drawings by E. H. Shepard and Arthur Rackham. This edition also includes Shepard’s famous map of the Wild Wood and rarely seen images by illustrators Graham Robertson, Paul Bransom, Nancy Barnhart, and Wyndham Payne. In an illuminating preface, Gauger explains how Grahame came to write the novel, which began as a bedtime story and then became a series of letters he wrote to his son, Alastair. This edition reproduces the original letters in their entirety and includes nearly a thousand delightful annotations on everything from automobiles (Toad drove an Armstrong Hardcastle Special Eight) and early motorcar etiquette to modern manifestations (Disneyland’s Mr. Toad’s Wild Ride). She reveals how William John Cavendish Bentinck-Scott, the peculiar Fifth Duke of Portland, built an extensive network of underground tunnels, thus inspiring the character of Badger, and she puts Grahame’s work in literary context, comparing him to Dickens, Rudyard Kipling, A. A. Milne, and Sir Arthur Conan Doyle. Finally, new to this edition, long buried in the Kenneth Grahame papers, are the notes, letters, and writings by Alastair Grahame and his governess, including several pieces by Kenneth Grahame himself that have never been published before. With a stunning, lyrical tribute to Grahame by Brian Jacques, the internationally best-selling author of the Redwall series, The Annotated Wind in the Willows should prove a most beautiful and enduring tribute to Grahame’s masterpiece.